sailboat. 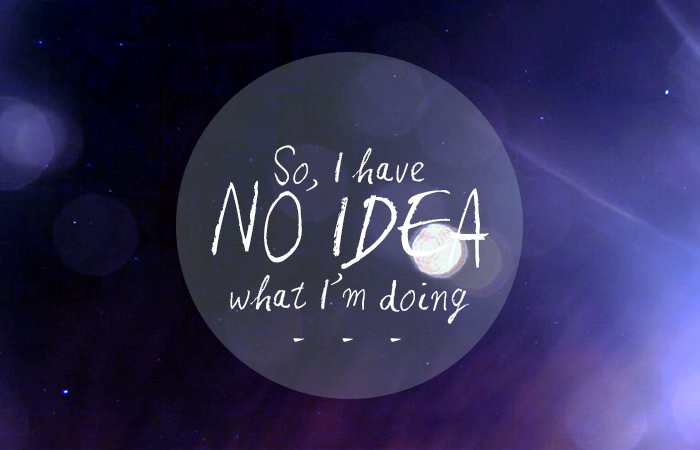 : So, I have absolutely NO idea what I'm doing! I feel you, Jennie! I'm 24 turning 25 in a couple of month (eek) - 4 years after graduation, I still have no idea what I'm doing with my life. I wish there's something or someone who would guide~ me as to where I should really be, but well - obviously, impossible. I envy those who know what they want to do. They make everything seem so easy. I have just posted something very similar I guess things like this happen to all of us. Feel free to take a look at what I wrote at www.thenortherngirl94.blogspot.co.uk hope you figure everything out soon. If I can give any advice as a somewhat 'older' person and that's try out the things that seem a little more radical, out there etc now. I lived with my parents until I was 30 so had no bills or outgoings etc and wish I'd taken advantage of that to explore the slightly less secure paths etc. Blogging was different back then and I was obviously in a different place but I imagine what I could've achieved from that place of security if I'd focussed on the blog etc. I pretty much left college and went into a job I loved and had a real career path I wanted... unfortunately I met a boy, went for a job that had more money so we could afford a mortgage and went down a career path that wasn't for me... missed out the opportunities of the other job and the relationship ended anyway (without a mortgage!). That said everything happens for a reason and I have no regrets and found myself in a job which I enjoy if not necessarily the dream career and of course on the flip side of doing things when you're younger when you reach a certain age and without children, committments etc there's almost the second chance to try new things! Hope that wasn't too much of a ramble!! Can I just stress how nice it is to know it's not just ME who thinks like this! I am in year 3 of my computer science degree - I am in fact on my placement as I type this yet I don't even think this is the career for me, I mean I like it, I'm reasonably good at it, great oppurtunities and fantastic pay but I just can't imagine me doing this for the rest of my life. I genuinely do NOT know what I want to 'be'. It's such a horrible feeling when all my friends love their jobs or have just graduated, or for the rest of my friends in my subject they are now in final year after skipping placement. :-( It felt so lovely though to know your in the same-ish boat. I am totally with you on this. I am on my final year of uni and I found I want so much in life that I'm trying to fit in a single year before I have to 'grow up'. My problem is I have sonly many things I want to go out and do but sadly don't have the means to do it. So instead I think about the things I can control in my life - the small things and split them up within the year while collecting the resources needed to do the big things. You're definitely not the only person that feels this way, you just have to go with your gut and take every opportunity you get and see what happens. It can feel awful if you are a control freak like me but worrying about it doesn't do much either and it's always good to dream. I'm in a similar situation to you and feeling very much the same way. I'd love to do an MSc but I just don't have the funds to do it right now. I'm considering taking a year out after my BSc to work full-time, hopefully something related to my degree but if not then anything will do. I think a year out will help me to see what I really want to do. I'm sure that we will both work out where we are meant to be in life, but it might take some time. it's more a security/back up plan for the future. So it's great to hear about your ultimate dream! great post jennie, you're definitely a talented writer. whilst you feel lost, maybe take a moment to feel proud of the successful blog you've built? i also find uncertainty difficult to deal with, i just try my best to embrace the unknown as exciting. Hey Jennie! You should not cross your dreams off your to do list that fast. I always think I'd never launch my business unless I'd win the lottery, that it was impossible, that I couldn't do it etc... Yet I made it. It's not always easy but it's so interesting. And I have done so many things I thought I could never do. This will sound really strange, but this post made me so, so happy! I'm going through something really similar at the moment and only yesterday was I able to admit it to one of my friends, because I'm in such denial. Everyone around me seems to have everything sorted out and I'm just feeling stuck, not knowing what I want to do with my life and how I want to spend this year off Uni. Reading this was like seeing my thoughts on the screen, making it a reality and something I should work on. I made basically this exact post last week but far less articulate - so I definitely get this feeling! Maybe no one really knows until they eventually fall into the thing that feels right. In a way it's comforting to know somebody else feels the same way that I do, in a way it's not as I just wish we knew where we we're heading and what we wanted and how to get it if that makes sense. I'm heading back into education in just less than a weeks time of which it took me ages to finally decide what I wanted to do. I already have a degree but have chosen to take a career change into law, I'm so bloomin scared you would not believe yet at times I think we just have to make these decisions and go for them. We won't know if they're the right ones until perhaps three or four years down the line, it's a risk we take. It could either be an amazing one or simply one we learn from. Oh Jennie, I don't think anyone know what they're doing with their life and the ones that appear like they do are lying :P rest assured you're not alone feeling lost. I totally feel that way at the moment post-Uni in my first 'proper grown up job' and questioning whether this is actually gonna be my career path for the rest of my life. I'm gradually learning that people normally don't have a clue what they're doing but somehow manage to 'go with the flow' and pursue opportunities that crop up. Even from glancing over the comments this seems to be the case. I've just finished my MA and honestly have no idea what i'm doing. I know what i want to do but feel like many of those things have slipped through my fingers somehow or another. My heart is set on doing a PhD and becoming a scholar but unfortunately although i got an unconditional offer to do one, there's no way i would ever be able to do it without a scholarship. To make things a bit more complicated i'm also moving to Australia in a few months as my partner is Australian and he needs to go back to start working again after having a hiatus over here in the UK whilst i finished my MA. I'm bloody terrified i won't find anything that i want to do over there job-wise (even the thought of full-time job hunting in the UK let alone abroad makes me feel anxious and nauseous!). Even if i do find a job the visa i'd be on only allows me 6 months with 1 employer until i get a partner visa. I've just got my fingers crossed that taking this leap of faith and leaving everything behind will work out somehow. Your little cafe and bookshop plan sounds so dreamy! I can really imagine you running somewhere like that! I think your writing is great- perhaps if you haven't already, dabble in trying to get a little freelance work or perhaps try get something published. I'm going to try and get some of my Master's essays and dissertation chapters published online to give me a little exposure and writing experience on my CV. Or perhaps you could try and get a tutor or proof reading role for others who are studying the same degree you have done to give you that extra bit of confidence in your writing abilities. Whatever you do i know you'll be successful! I'm not generally good with the commenting, but I feel exactly the same way at the moment. My degree is coming to an end this time next year and while I have certain dreams (some not unlike yours!) I'm not sure if I'm good enough to actually pursue them. Jennie I love your blog and I think you're doing an amazing job so far. When I left University I traved for a year hoping that would allow me to decide what I wanted to do with my future, 5 years later I still have no idea! I turned 28 today, I figured I would know what I should be doing by now and I still don't. I wouldn't worry about it too much as there are many people in the same boat as you, but from my experience (because I didn't do this) is to just go for your dreams, if it doesn't work out or you don't enjoy it you can always try something else. I read something today which said 'Winners are just losers who gave it one more go', just don't give up before you start (my biggest failure is that I am too scared of failure that I never start). Most people don't really know what they are doing; most of us are just winging it whether we admit it or not. I worked in a rubbish retail job for ages.. I hate it.. but it gave me the time and money to set up my business, which I literally did not have a clue would end up becoming my full time job. I could have written a lot of this post myself a few years ago, even now really. I think there is always a lot of unknown. I went through uni feeling like I knew where I was heading and what I was doing, but then when I got out into the big wide world I felt lost and didn't know what I wanted to do. I felt like I could do anything, but what did I want to do? Not a clue. I knew what I didn't want to do and I definitely did not want a boring job that I would have to go to every day for the rest of my life. I had lots of big ideas and ideals, but a lot of them when I thought about them in reality weren't as good as they were made out to be. I had lots of ideas in my head of things I'd like to do or be, a writer, a publisher, an interior designer, a photographer, a scientist, but I ended up temping, I didn't want to be stuck in a job I hated. I eventually found a job I enjoyed (working with kids) and sometimes you just have to take a plunge into the unknown and something that you may love. The unknown will eventually become known and then a lot less scary. This year I have started teacher training too, totally terrifying, but I'm hoping I will have a job I love.